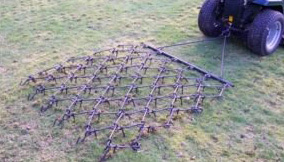 The benefits of using chain harrows for grass care have been known for many years. Chain harrowing of grass is a proven method to scarify the soil around the grass plant, pulling out weeds and moss as well as aerating and breaking up the surface crusting. This action of harrowing stimulates new growth of grass. SCH chain harrows can be used on lawns, pasture and paddocks, golf courses and sporting fields. They will also restore a level surface to all weather tracks and are a useful tool in helping to produce a fine tilth for seeding. The major feature of the SCH 3WCH5 harrow is that it can be pulled in three different modes to suit the surface to be harrowed. A straight pull on the harrows creates an aggressive application for normal scaritying. Reversing the tow bar to the other end of the harrow gives a less aggessive application. Turn the whole harrow upside down for levelling. The SCH 3WCH5 requires a minium of 12hp pulling power. It is difficult to give an exact horse power requirement as terrain can vary. Surfaces that are very heavy soil or steep slopes will need more power. SCH products sold by us are supplied ready for use and delivered using an individual service rather than a parcel/pallet carrier. Delivery will be made in approximately two weeks, however we will try to deliver sooner. You will be contacted by telephone prior to despatch to arrange a day and time for delivery. Some items, such as trailers can be supplied with the chassis painted to match the colour of your tractor or ride on mower, please contact us for more information on 01603 738635 prior to ordering.